You probably don’t need much convincing that Paris, France is worth a visit. Still, here’s everything we’ve written so far about one of the most beautiful cities on the planet. We’ve been to Paris twice, once in October of 2016 for a one week stay, and again for a week in 2017 as the end of our road trip through France. On both trips, we did most of our exploring on foot, pushing our daughter around in her stroller. She probably won’t remember a moment of it, but for those of us who were more than a year old, it was unforgettable. Are you going to Paris, France in the Fall? We did too! Here’s a post about how we enjoyed a beautiful city at a beautiful time of year. You might be surprised to hear that we actually enjoyed October in Paris more than we enjoyed June. In this post we walk you through how to use photography to tell a story about travel and family. We use the preparation of a meal with ingredients purchased from a Parisian farmers’ market as an example of how stories compelling in a more personal way than monuments and vistas. This is a list of the apartments we rented through Airbnb while we were in Paris, France on our October trip. It was our first time traveling abroad with our baby daughter, and there were a few things we did right and a few things we did wrong. A look at the iconic Louvre Pyramid from a photographer’s perspective. During our Fall trip to Paris, we stopped by the pyramid at night, and in the Spring we took some photos early in the morning. There are a few lessons in photography, but maybe the best reason to read this post is to look a all the pretty pictures. In October 2016, Pont Alexandre III was between our apartment and many of our other favorite attractions. This meant we walked by it many times and had many opportunities to impulsively stop for a photo shoot. Pont Alexandre III is a beautiful, ornate bridge with amazing views of the Eiffel Tower. There’s a reason you can always find someone there taking pictures. We got up early in the morning to photograph the Bir Hakeem Bridge in Paris, and decided that the best way to capture the amazing shapes of the unusual bridge was to use black and white photography. We used the experience as an example to teach how and when we make the decision to forego color in our images to focus on shape and contrast. Our all day trip to Versailles from Paris was our first experience taking our baby daughter on such a long photography session. In between marveling at the sheer size and opulence of the palace and gardens, we talk about work/family balance, and how we learned to make sure that are thinking the right way when we walk out the door. If you have never seen photos of Versailles, you need to check this post out. 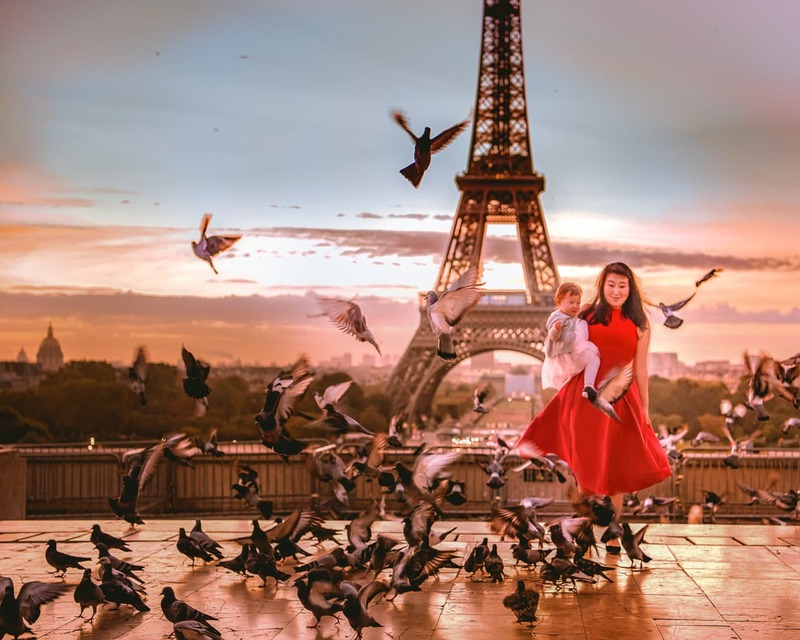 We love taking Lisa on picnics while we travel, and while we were in Paris, where else would we do it than on the lawn of the Eiffel Tower. This is the story of how we created our best travel photo ever. In order to capture what we love about Paris (the real and the imagined), we made several trips to t the same spot, early in the morning until we got everything right. Mornings like we talk about in this post are exactly what we love about our slow travel adventure. In Paris you never have to look too far for a beautiful garden. The Luxembourg Garden is famous not just for it’s flowers and rows of manicured trees. It also sits in front of a lovely palace, and is home to an iconic pool where children play with sailboats. We stopped there with Lisa to eat some pastries and enjoy the morning (which quickly turned into afternoon). We stumbled upon this old post from 2016 before we left on our first overseas trip with our baby daughter, Lisa. It’s like a little time capsule in which we describe the state of our lives and of our minds as we prepare for a big adventure and reflect on other big changes that were happening in our lives. It’s amazing how long ago that seems now, and how much our perspective has changed.